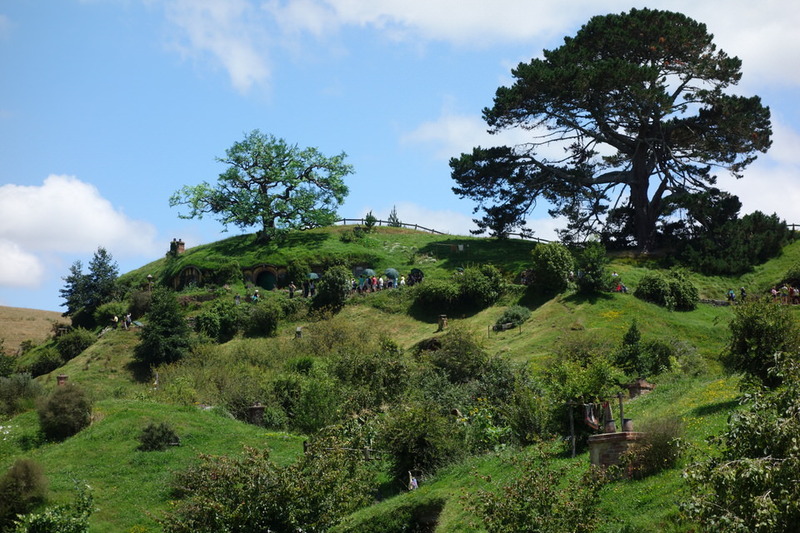 We disembark our cruise in Auckland, NZ and after picking up our rental car, we leave immediately on our 2 hour drive to Matamata where we hope to go on a tour to Hobbiton, which can only be accessed via an organized tour. Only as we arrive do we consider that prebooking might have been advisable. Fortunately we do get a spot, albeit later in the day than we hoped for. 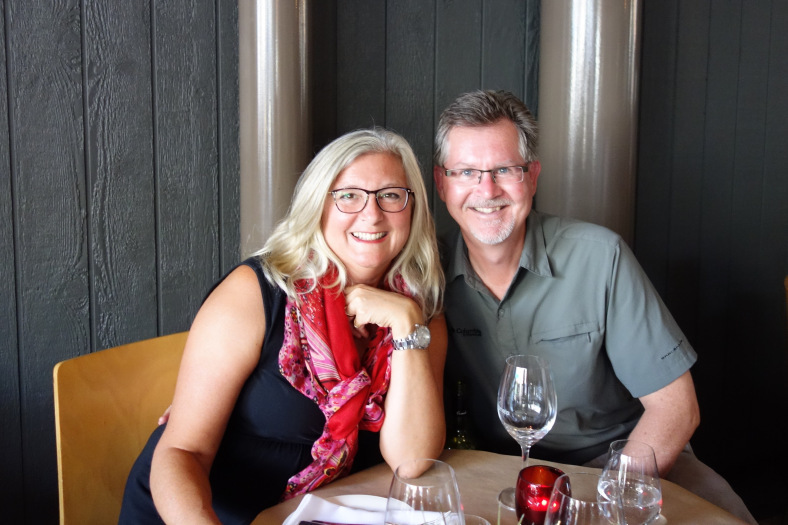 (We actually had tour prearranged from a cruise stop in Tauranga, which had to be cancelled when the port master refused to let our ship dock due to high winds.) 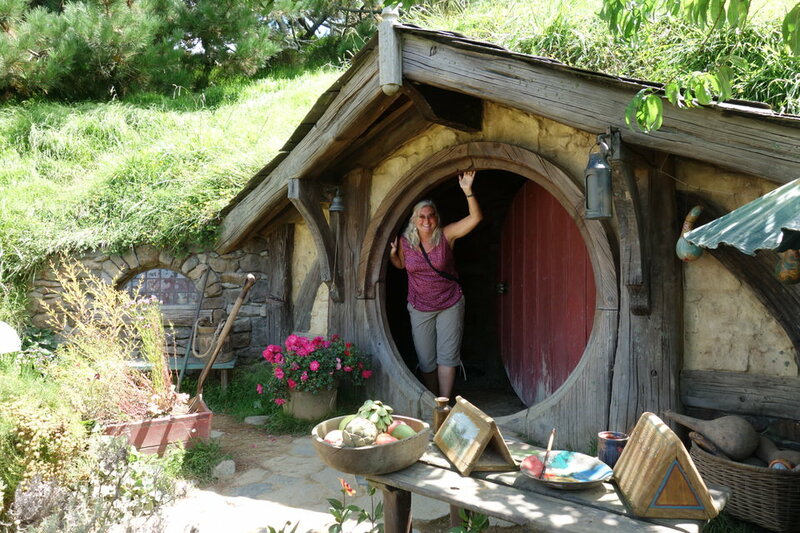 But, we weren’t about to miss an opportunity to visit The Shire, even though we had to forego our plans to experience Cathedral Cove on our first day on our own in NZ after the cruise. 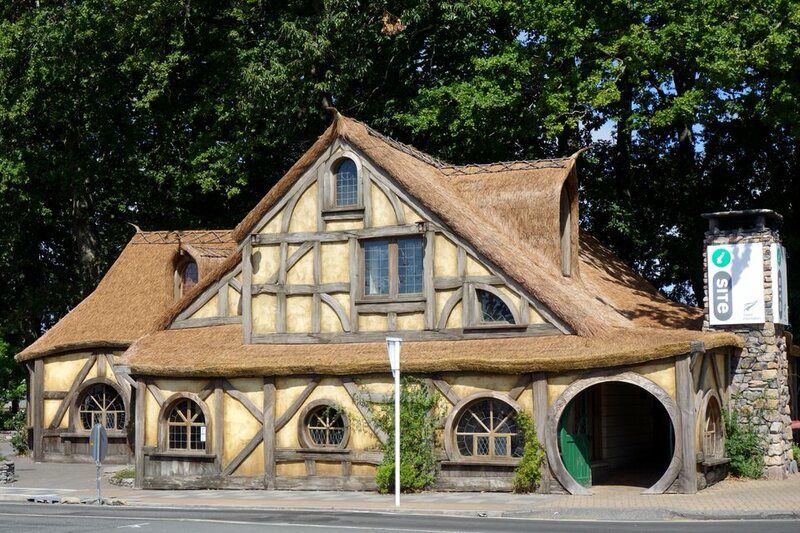 Anyway, we arrive in Matamata and discover that the i-site where we need to book the tour is very easy to locate, for obvious reasons. I am so excited! As it turns out, the long drive and expense are totally worth it. 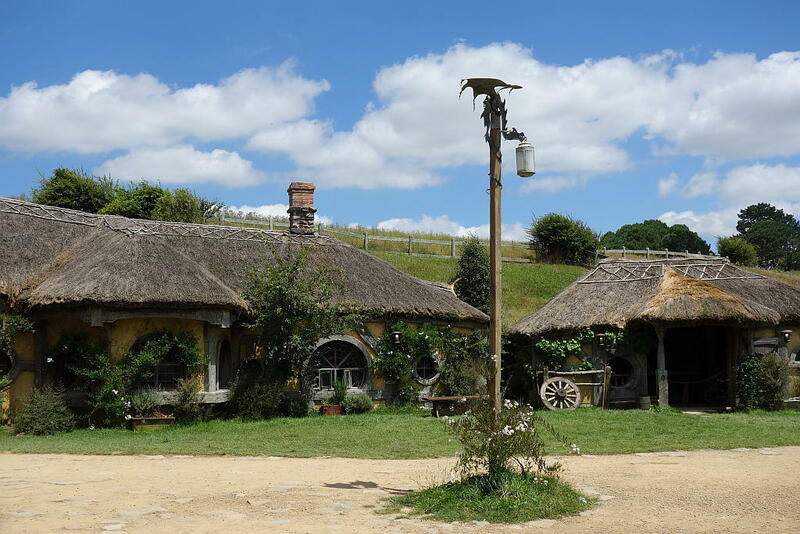 Visiting the shire was everything that I hoped it would be. 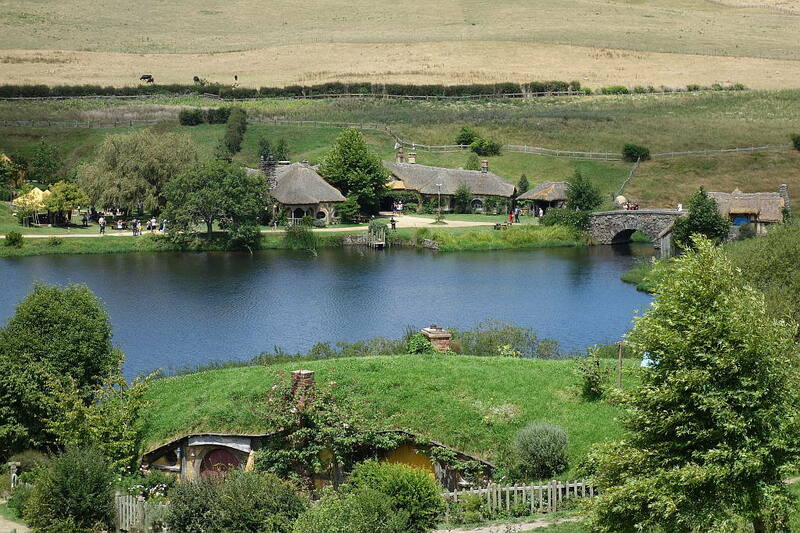 This is the Shire. There are many round doorways, not visible in this picture, but if you look closely you can see the chimneys sticking out from the ground. 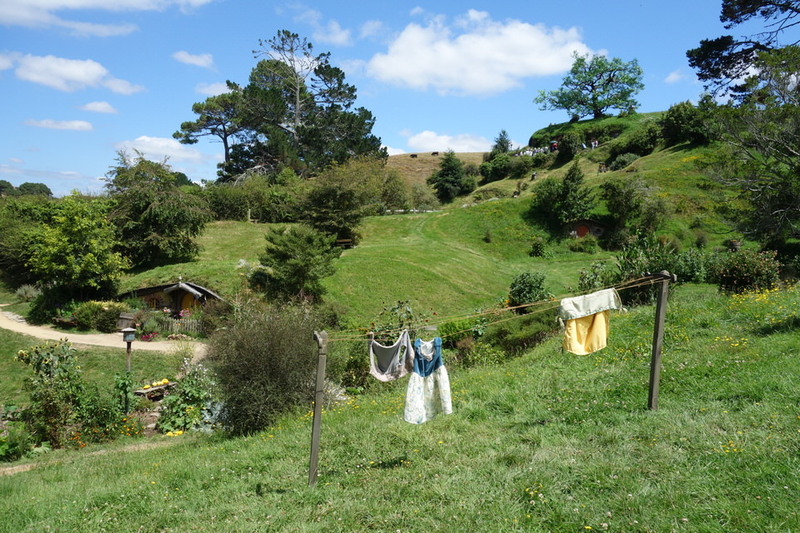 But look at the top of the hill, beneath the tree on the left, you can see Bilbo’s house. 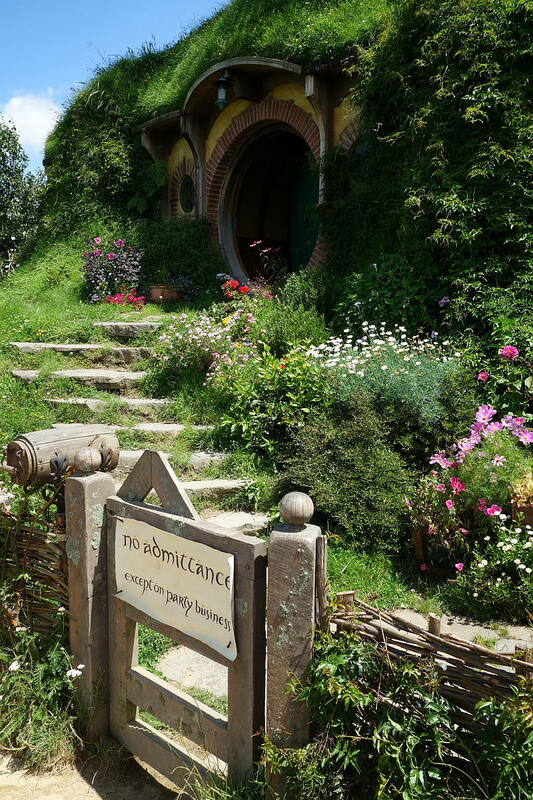 They say to save the best for last, but this was my favorite hobbit entrance because of all the pretty flowers. 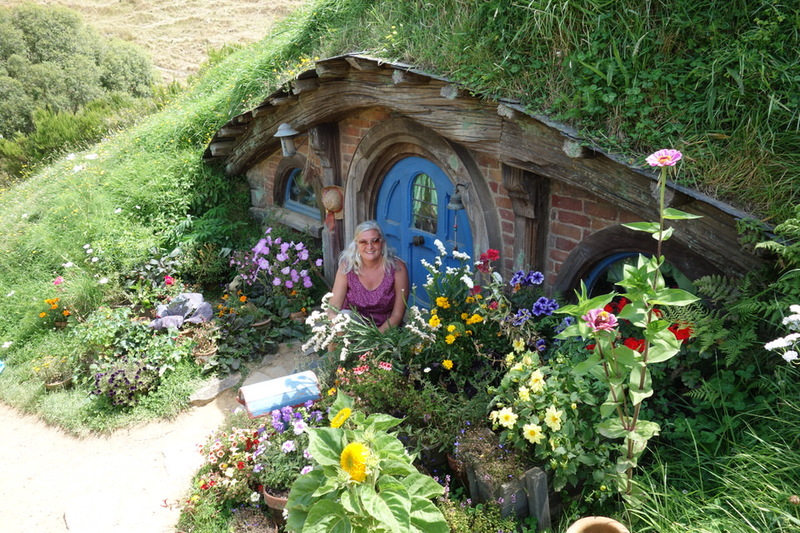 Obviously this hobbit had a green thumb. These hobbits are smaller than I thought. 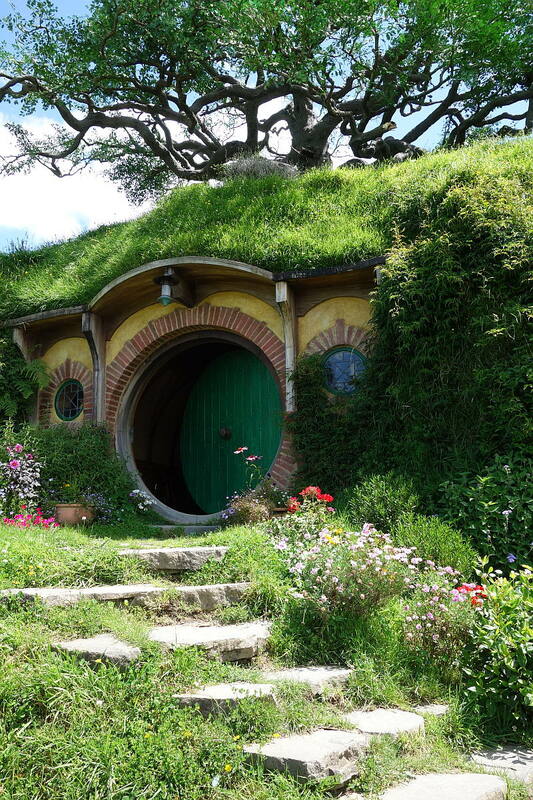 As we climb the hill we approach Bag End, Bilbo’s house. Notice the Oak tree right above his doorway. 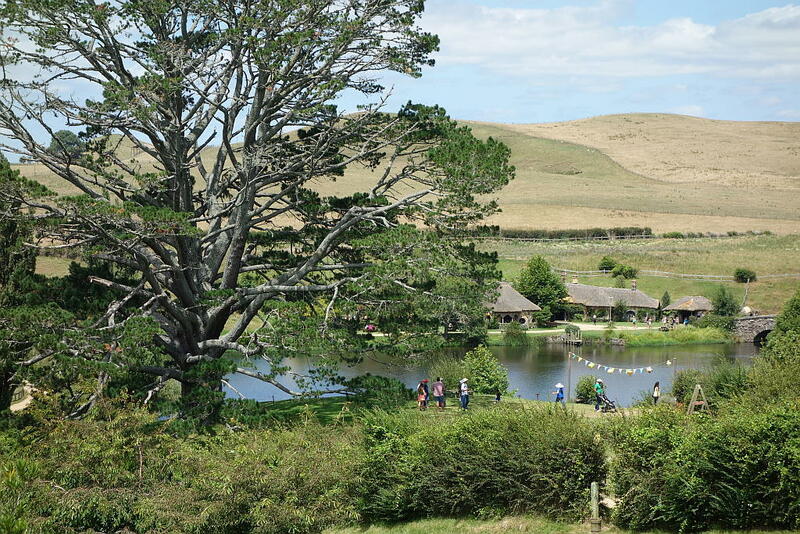 Not content with the already massive living trees on site, Peter Jackson wanted a particular tree above Bag End. 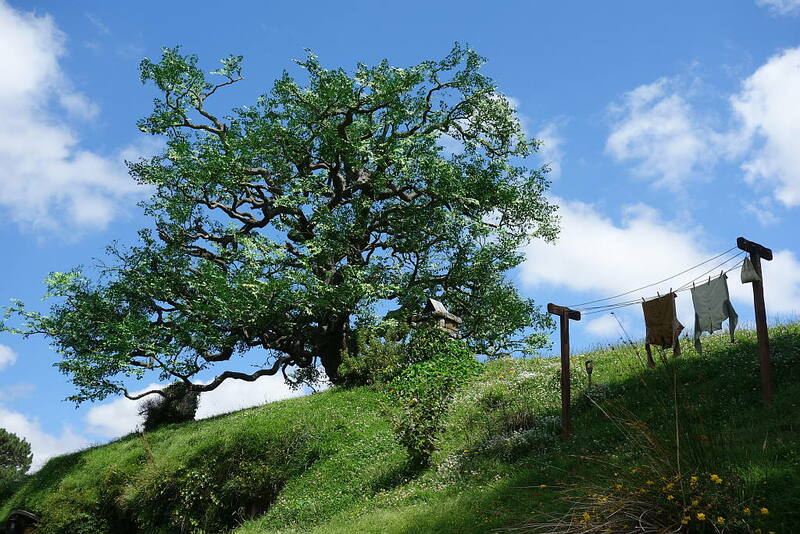 This tree was taken, in pieces, from nearby Matamata and reassembled on site with bolts. Fake leaves were imported from Tiawan and individually wired on. When they began to fade, they were repainted by hand. 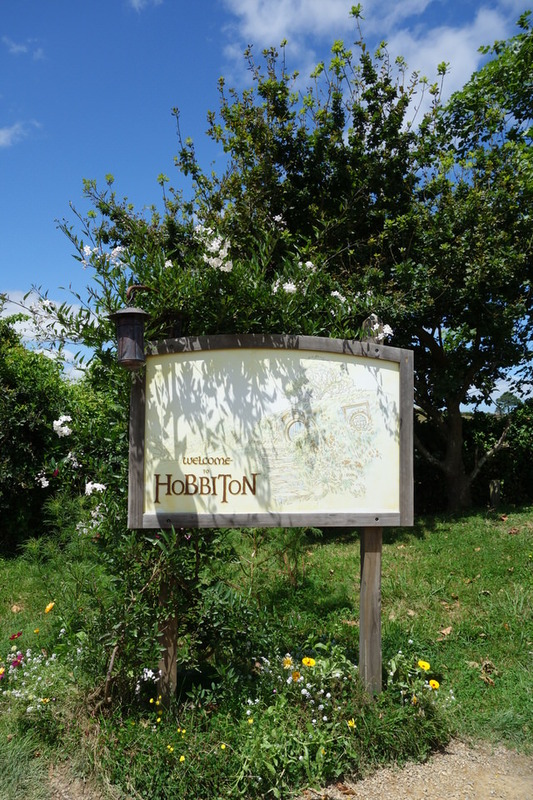 This sign doesn’t appear until the opening scenes of “The Lord of the Rings” when Bilbo is planning his disappearance at his eleventy first (111) birthday party. 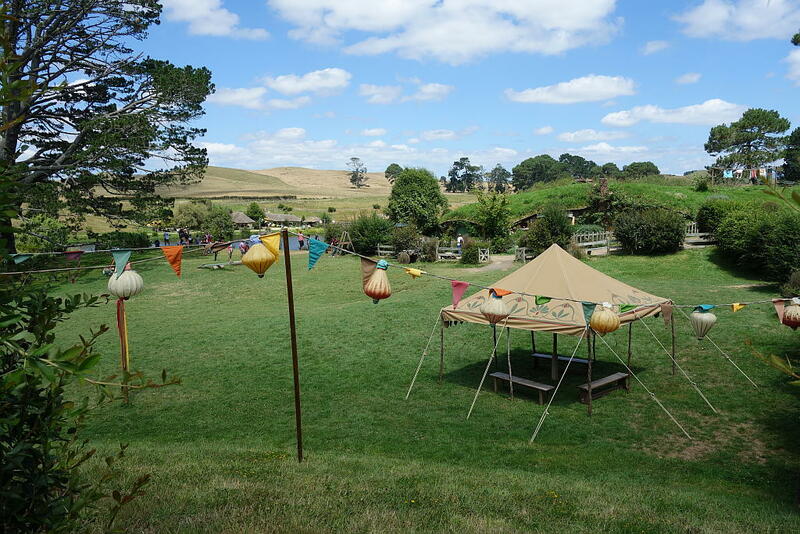 Bilbo’s 111st birthday party starts out the Lord of the Rings Trilogy. It is one of my favorite scenes in the story as it is the last truly light hearted one in the series (although there are moments of respite such as in Rivendell or after the destruction of Saruman’s Isengard when Merry and Pippen make merry with the spoils.) 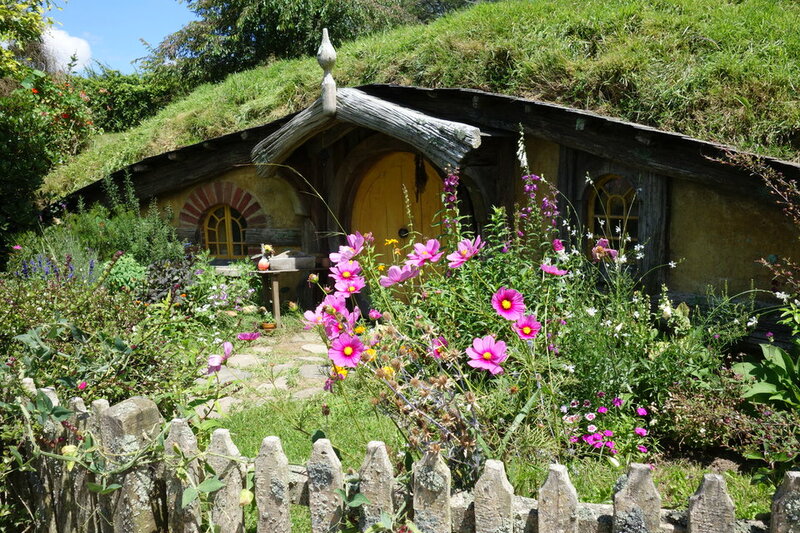 Bilbo’s party gives us one of the best insights into the personality of the hobbits with their love of drink, and food, and dancing, and sometimes mischievous merry making. Gandalf gets into the spirit of things and provides spectacular fireworks. The Party Tree (a real live tree) with the Green Dragon Pub in the background. 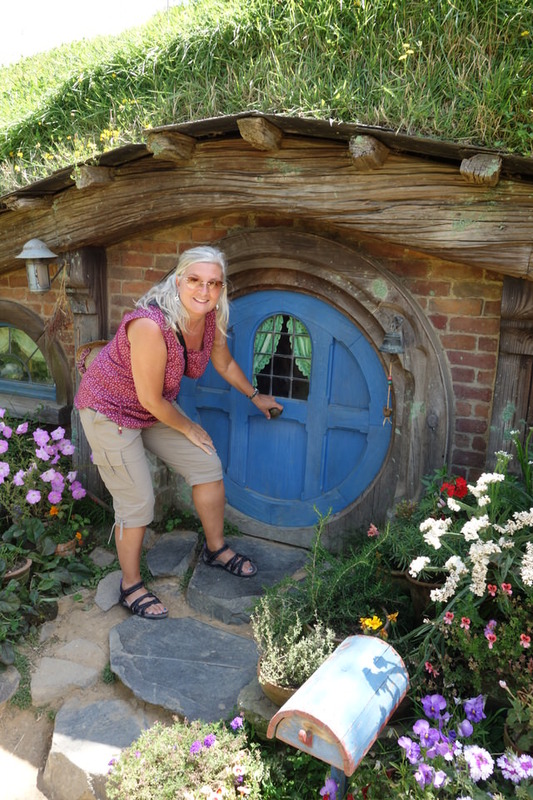 This entry was posted in New Zealand Cruise 2015 and tagged Hobbiton, The Hobbit, The Lord of the Rings, The Shire. Bookmark the permalink. We too are big LOTR fans and faithfully watch the movies once a year (even though they sometimes deviate from the books). It looks like you had a wonderful time! I think we have to add this to our bucket list. Thanks for sharing! Val, you could do what we did and cruise around New Zealand. It was altogether a wonderful experience. 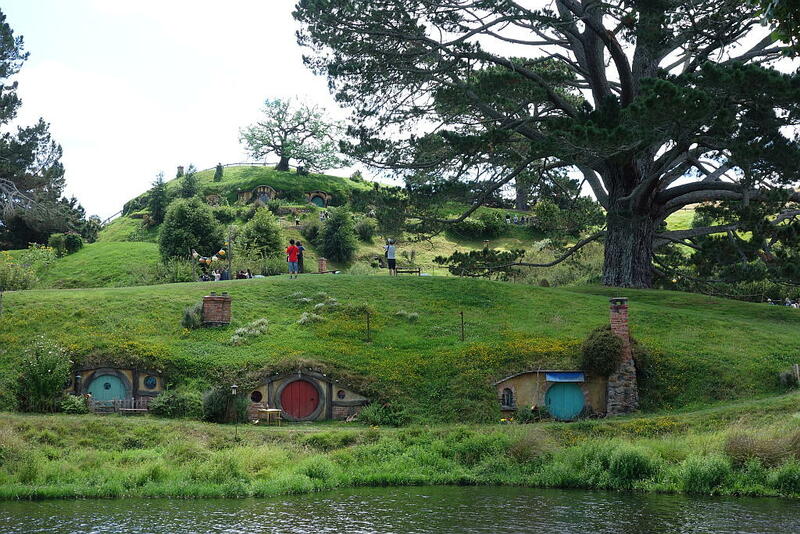 But, I admit, I saw a lot of New Zealand through the eyes of a person seeing Lord of the Rings movie sets. Oh I so want to visit here. 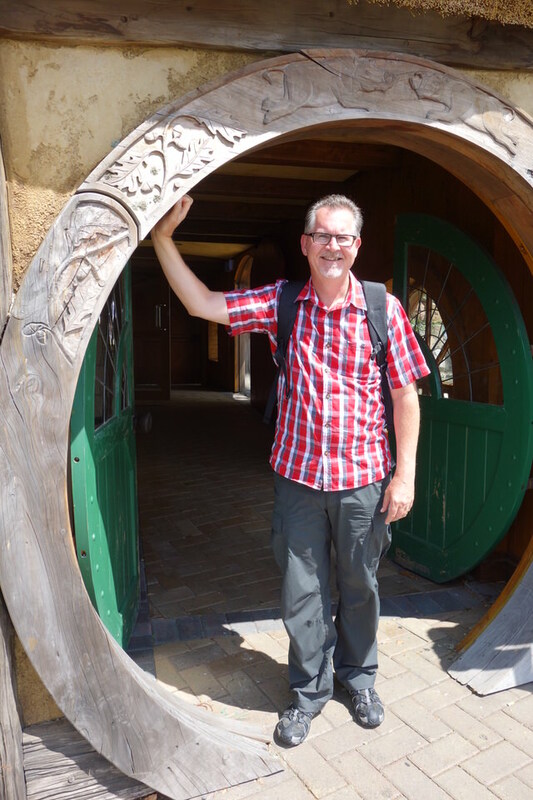 I too am a huge Hobbit fan. It looks enchanting! Thanks for sharing Di! Yes, it was a special experience, and we had a wonderful sunny day to enjoy it. All of New Zealand is special and I think that you and Rick would enjoy it very much.